SummerChasers Stories: il Melliore! il melliore! I can now cross "attending an F1 race" off of my life's to-do list. It's definitely a cool experience, but oddly enough it wasn't as crazy as I had expected, although the Finnish fans of Kimi Raikkonen were certainly doing it up. A former coworker from MacDon Testing days Rod Petersen met me in Milan to attend the race since he's currently residing in Danmark [sic]. 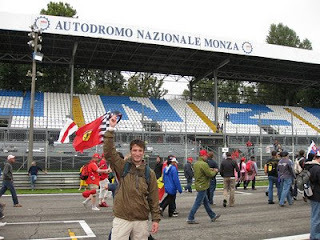 Neither of us were wearing the bright red of Ferrari unlike the legions of fans that we followed onto the metro, onto the train, onto the bus and finally onto the circuit grounds. That was the joke - you're never lost, just follow the Ferrari's! The weather sort of sucked - rained all weekend. But I rather enjoyed the sight of the water spraying off of the tires, billowing behind the car like a jet trail. The extreme wet tires that they were all running can displace 15 (or 50?) litres of water per second! On Saturday when we were watching the qualifying, when the first car came up to our viewpoint at an unfathomable speed we thought for sure he was going to slide right off of the curve into the wall. But no, with a loud pop of the engine/gearbox for a downshift the cars stuck to the pavement like glue, zipping around the parabolic curve - no problemo! We watched the race on TV once we got back to our hotel room. In some ways it's far better to watch the race on TV as you can see the whole race (not just the 200m in front of you), there are replays and the views are better. But to appreciate the speed at which these cars are going, you have to be there. It's crazy fast. And so loud. Ear plugs (thanks MD!) are mandatory. Standing in the porta-potty the sound from the cars downshifting rattles the entire thing. I never saw another friend there - Clint - failing to coordinate meeting places. But we ran into a nice couple from SK 3 times over the 2 days. Strange how it works in big crowds. There's so much to say about this weekend - how the track in Monza is tucked away amongst the trees of a nice park, how we'd rather eat a pizza at BP's back home instead of a fresh Italian one, and how Italian women attend car races in high heels and mini skirts. Fantastico! Currently I'm at 11,900m above Sarajevo, flying back to Istanbul to meet Julie to continue our journey to Beijing tomorrow.